Several Northern European cultures have a shared mythos called "The Wild Hunt." 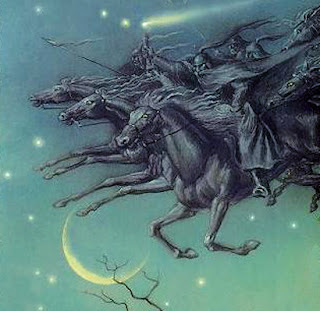 The stories vary, but overall the premise is the same: An "otherworldly" army on horseback, led by a deity of some sort, usually accompanied by wild dogs (goats or hogs) is set loose to 'hunt' lost souls. Those who are living can get caught in the path, and be taken by 'accident'. Here is my Wild Hunt tale. The truth is in the telling. 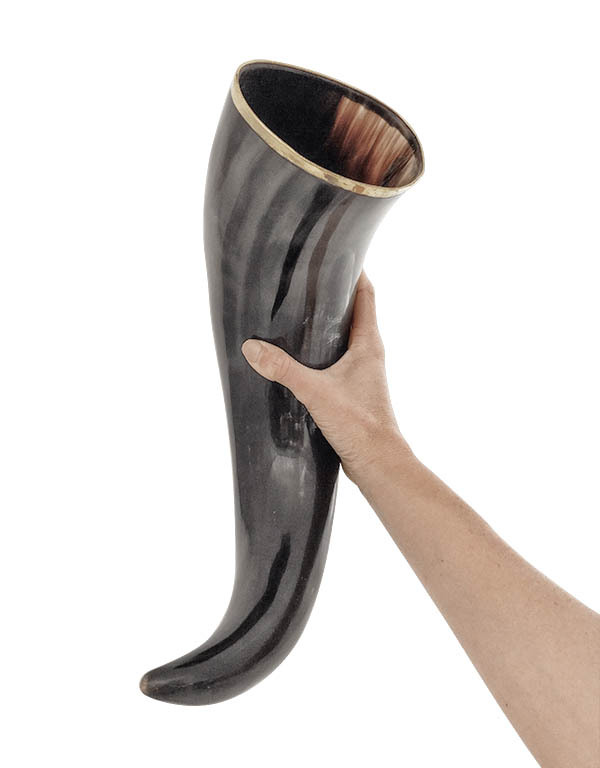 Once upon a time (as all good stories begin), there was a man who received a drinking horn as a gift. This was a coveted gift, as he had longed for this exact horn for many years. Being a follower of Odin, he dedicated his drinking horn to the All-Father. This man had a very easy life. He had a woman who loved him and worked so he didn't have to. He lived quite the life of luxury, spending his days sleeping, and his nights wandering through the other worlds. Still, he felt unsatisfied. 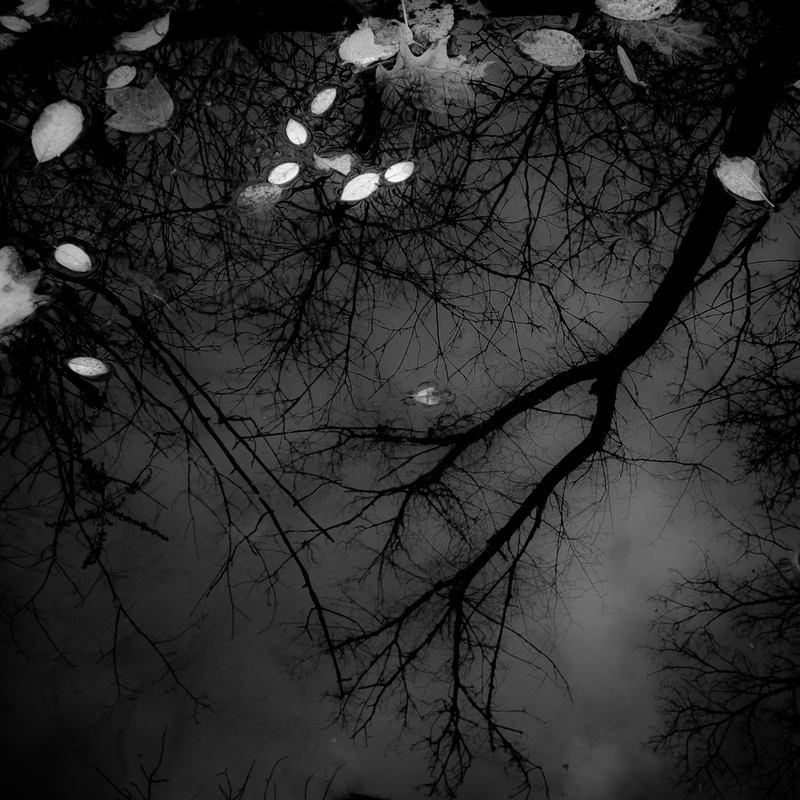 He had been feeling quite sorry for himself for a very long time, and ventured out alone into the woods late one October night. The man had forgotten to bring a lantern, and the moon was dark. He'd been in these woods so many times, he could navigate them blind-folded. He felt his way around until he found a stump to sit on by a creek. His thoughts began to wander, and he found himself believing he was ready to move on from this life. He called out into the silence of the night that Death should come and take him. All he heard was the babbling of the brook. He took up his horn, and began drinking mead, as he was wont to do. He had gotten quite comfortable, wallowing in his self-pity, when suddenly, he heard the sound of something rapidly crashing through the woods. He could tell that this was not any animal he knew. The pace was much too deliberate, much too targeted. He heard the sound of hooves, but couldn't see anything. He felt an oppressive force rushing toward him, and instinctively, he knew it wanted to take him. As the force got louder, and faster, and closer, he realized that he was not ready to go anywhere, particularly to the other side of the veil! He scrambled up the hill, feeling the hot breath of a horse and rider on the back of his neck. He ran as fast as he could to the safety of his home, slamming the door shut behind him. 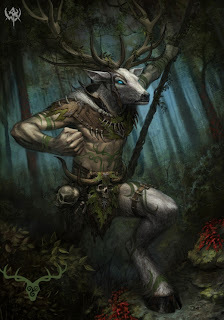 Strongly shaken by the experience, it took him awhile to realize that his drinking horn was not in hand, and was quite likely lost in the woods. He calmed himself, grabbed a lantern, and re-traced his steps to the spot where he had been, convinced that he imagined what he'd just experienced, blaming it all on the mead. He spent a good while searching, to no avail. He prayed to Odin to help him find his beloved drinking horn. After several hours of hunting, he returned home, heart-broken at the loss of his sacred object. He was also more than a bit angry with Odin. He had dedicated that horn to Odin, and to his mind, Odin should have answered his call for help. But, The All-Father does not work that way. 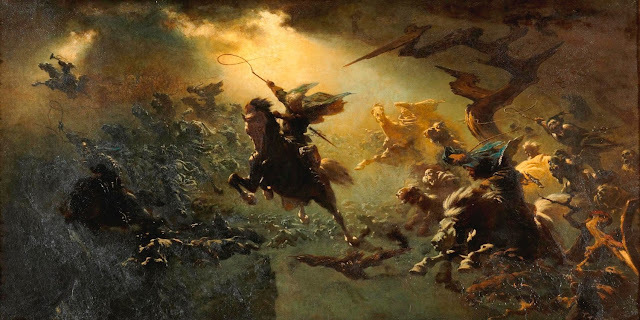 Gods like Odin expect folks to know what they want, and be prepared to accept the consequences, for good or otherwise, when they pray, and when they act. He spent the night pondering his experience, and feeling even more sorry for himself than before it happened. No one knows for sure what was out in the woods that night. Was it Odin, the Wild Hunter, coming to the man's call for death? Did Odin see that this lost soul was not ready die, but needed a little jolt to wake him up? Perhaps Odin has a unique sense of humor. 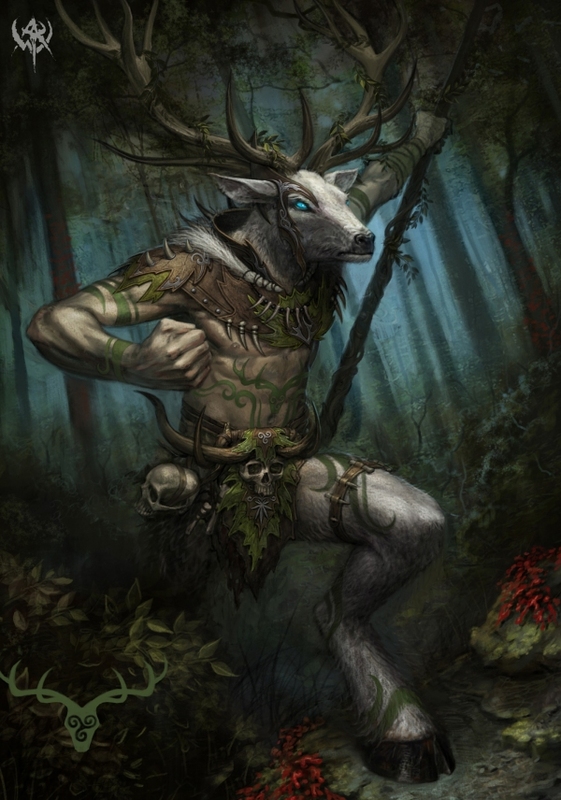 The next day, the man found his horn, gently placed just at the edge of the woods, hidden in plain sight - not at all near his original location. Perhaps Odin answered his call for help, and in more than one way. When the man touched the horn, he was given an epiphany. In that moment, he realized that he wanted to live. He wanted to experience what life has to offer, and see how it feels to grow old. He thought of the woman who loved him, the family who had taken him in. He realized that all of his sorrows were self-inflicted. He had been cruising through his life with no purpose. He stopped feeling sorry for himself, gave up the mead, and placed the horn in a place of honor near his altar to the All-Father. He took up farming, and in a very short time, he connected to the land, and to his blessings. He made it a point to value each day, and lived a long life, filled with happiness and gratitude. He remembered his experience, and cautioned all who hear the tale, that one should be careful what he wishes for, especially on a dark October night when the veil is thin. He could have just as easily gotten what he'd asked for.